Nothing says summer like pesto. I LOVE pesto and recently have started experimenting outside the basil box. You can get super creative with pestos, using different greens such as kale and arugula or herbs like cilantro and parsley. They’re all rich in antioxidants and nutrients. If you want another variation, try a rich, creamy pesto. If you’re dairy free like me, fear not: The mighty avocado has your back. 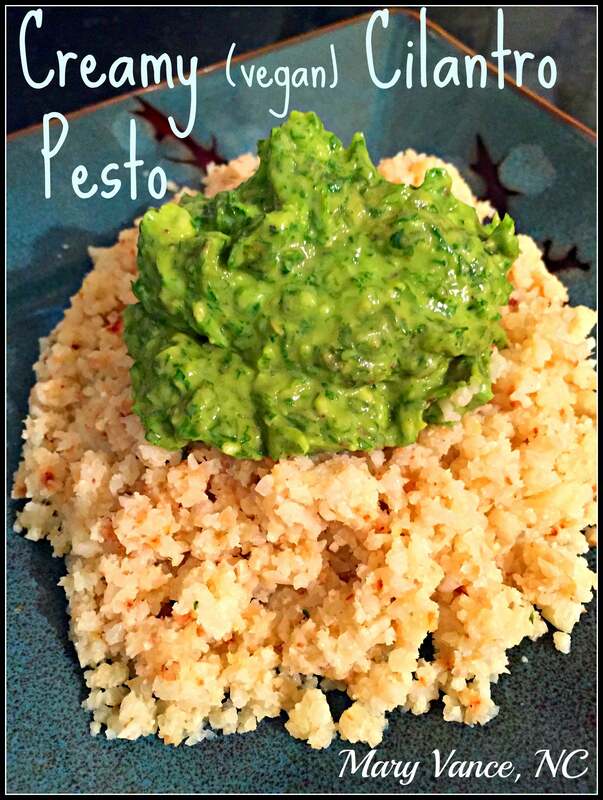 Avocado is mild enough to give pesto a creaminess without an overpowering flavor. You won’t miss the cheese, either. This simple recipe is easily adaptable to whatever greens you have in your fridge (and is a great way to use up leftover greens of all types). I chose cilantro here because I love it, and it’s packed with nutritive benefits. You can use a combo of parsley and cilantro; basil and arugula; kale and basil; you get the picture. I really should call this superfood cilantro pesto. Isn’t it wonderful when something so good for you is SO delicious? Here it is again when I made it with basil. Cilantro is most well known for chelating mercury and heavy metals and assisting in their excretion from the body. It’s also rich in vitamin K, antioxidants, and minerals. Avocado is rich in fiber and glutathione, a crucial antioxidant needed for liver detox and anti-aging. Contains more potassium than a banana! Also a great source of healthy fats, so it’s excellent for skin and anti-aging. Provides vitamin K, folate, and a handful of B vitamins. Olive oil is anti-inflammatory and high in phenolic antioxidants. Very cardio-protective. I use and recommend this brand for day to day use. Garlic has potent medicinal properties courtesy of allicin, which is anti-pathogenic. I use allicin-based supplements as part of my candida and parasite protocols. Garlic wards off sickness and boosts immune health. May also improve cardiovascular health. I served this over cauliflower rice (pictured above), and it was the absolute best thing I have eaten in recent memory. You could also serve it over brown rice pasta or zucchini noodles made with your spiral slicer, or use it to top salmon or steak. Would be great with scrambled eggs or roasted veggies. You can’t go wrong with this beauty. Enjoy! Pull leaves from stems and add to food processor. Scoop avocado into food processor and add 2 tbsp of olive oil along with rest of ingredients. Pulse until it becomes a paste and leaves are broken down. You'll probably need to add more olive oil at this point, depending on how thick you want it. I've also added a spoonful of pine nuts for added richness. Store in the fridge. I recommend squeezing a little lemon juice over the top for storage, or it'll turn brown pretty quickly. Pesto makes such a flavorful topping for just about any dish. 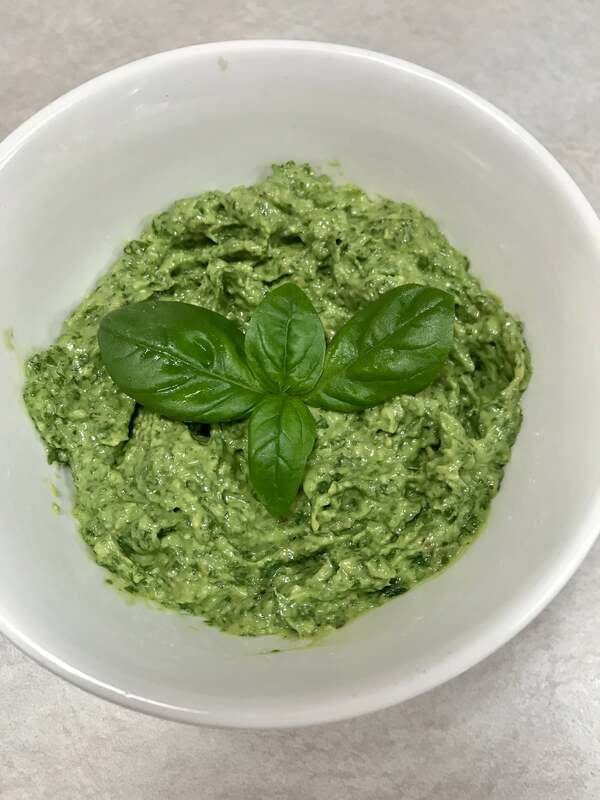 Im always glad to find a pesto recipe that does not have nuts. avocado is perfect! I was just craving for some pesto. This sounds delicious, I will be making this. subbing avocado is a great idea. I don’t think you need olive oil. There is enough good fat in the avocado. However I did add nutritional yeast to make it cheesy and I used basil instead of cilantro. It was soooooo goood! !